NTT has begun selling a device that transmits data across the surface of the human body and lets users communicate with electronic devices simply by touching them, the company announced on April 23. 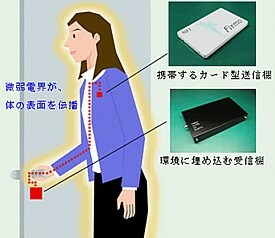 The new product, called "Firmo," consists of a card-sized transmitter carried in the user's pocket. The card converts stored data into a weak AC electric field that extends across the body, and when the user touches a device or object embedded with a compatible receiver, the electric field is converted back into a data signal that can be read by the device. For now, Firmo transfers data at 230kbps, but NTT is reportedly working on a low-cost 10Mbps version that can handle audio/video data transfers. Firmo is based on NTT's RedTacton human area network (HAN) technology, which is designed to allow convenient human-machine data exchange through natural physical contact -- even through clothing, gloves and shoes. NTT initially hopes this human area network technology will appeal to organizations looking to boost convenience and security in the office. Obvious applications include secure entrances and keyless cabinets that recognize employees when they touch the door handle (thus bypassing the need for card-swipers and keys), or secure printers that operate only when you touch them. For now, a set of 5 card transmitters and 1 receiver goes for around 800,000 yen ($8,000), but NTT expects the price to come down when mass production begins. Again a little step forward becoming cyborgs. if a employee opens the door then how do the receiver identifies the employee's hand,i mean is it stored in the receiver ,if yes then how????? i can also transfer data, so is red tacton a software? can our mobile phones be used as receiver and transmiter.